Good post, and I agree, that the first POM of a project series is gargantuan. 2 - All the build steps you use. Then have your internal projects inherited from that basic POM. Once setup, you can have an inherited POM in as few as 6 lines of XML. (I typically have about 20 because I specify SCM, name, and a few other metadata-elements). Very nice. Get ready for the Mavenites to swarm in and let you know you are just too stupid to use it right. i agree with your expectations. and indeed they are working on some of the issues for maven 3.
i'm using maven frequently ever since 2.0 came out and i must say i'm feeling pretty comfortable at the moment when it comes down to building java projects with it. i think there's one real 'problem' though, like you said: too much for one tool. as a consequence it attracts a lot people, but you can't please everybody. also, when you aim to do it all (deps, lifecycle, reports, releasing, ...), you need to provide a pretty big library of documentation. i don't know if maven 3 will convince people who are not satisfied with the current implementation. don't know if that's the point either. i've seen some examples about declaring dependencies in for example a groovy DSL. but for me that doesn't change anything if the DSL is simply to provide an alternative to XML. i don't really care about the number of characters (within certain constraints of course). i think the actual (for me minor, but still) problem is still not solved: how to do stuff which is not available in a plug-in? will it be possible to write a groovy recursion on a couple of directories and do some magic stuff, right there in the groovy pom file? that's what people are talking about when they say maven needs scripting support. gradle offers this kind of stuff, but has a long way to go. so for a while i'll keep on using maven and (g)ant and keep up-to-date with gradle. "Copying a file after the build is done?" - the particular problem (log4j) is explained in stackoverflow. General problem of copying a file - use Hudson :) Maven will build your artifact (it was designed to do it) and Hudson will do the after steps. On the IDEA support, the article you linked to is 2 years old and handles IDEA 7. We're already at 9.0.1 and the Maven support is unparalleled. Even Netbeans' support is superb. Only Eclipse is lagging behind a bit, but even m2eclipse is not bad at the moment. Well, I'm by no means a .NET expert, but perhaps .NET people need to have a tool for dependency management, for building projects etc. But yeah, that's many tools and not one. I do share your doubts and I am certainly hoping for scripting flexibility from Groovy and not just an XML notation replacement! Cześć Grzesiek :), I know Hudson (or other Continuous Injection engines, for that matter) can copy files to places. It's just that this is a bit too simple in my environment when we have multiple locations and each developer has their own; and the requirement is that I decide when to copy the file - not an automated Hudson process. For the record, I solved it with the maven-upload-plugin. About the standardization - absolutely! Thanks for your information, I will check it out and update the article. I am having serious problems with m2eclipse at the moment (https://issues.sonatype.org/browse/MNGECLIPSE-2110), so I am a bit skeptical about it. 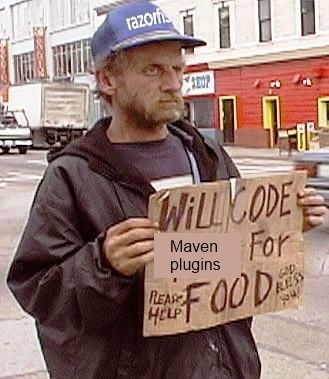 I will try using Maven in NetBeans though. Thanks everyone for reading and your comments!